As you search for a new home, you may find yourself coming across listings that are classified as being a part of an HOA. It is estimated that one in five homes in the US are part of an HOA, especially when it comes to newer builds. Here are some quick facts about HOAs and the pros and cons that come along with buying an HOA property. 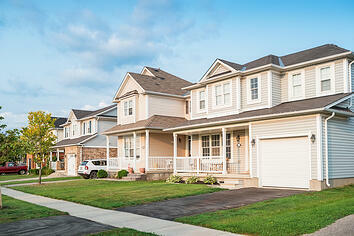 A Home Owner’s Association, or HOA, is the governing body of a managed community. When you move into a community that has an HOA; condo, townhouse, or planned development, you must pay a monthly or annual fee for your membership. An HOA neighborhood may provide you and your family access to amenities, such as a pool, tennis court, or gym, which you may not have been able to afford otherwise. Your HOA will handle the maintenance of common and shared areas in your development. They may also include snow removal, giving you one less thing to worry about as a homeowner. There are rules on how the outside of your home has to look when you live in an HOA development, so you don’t have to worry about a neighbor not taking care of their yard. The HOA will act on your behalf if you have an issue with your neighbor. For example, say your neighbor is constantly throwing late night parties that disrupt you and your family. It would then be the job of the HOA, not you, to reach out the neighbor in order to fix the problem. Furthermore, there's a chance that there may be a rule about these violations that an HOA can enforce. A monthly fee is incorporated into your monthly mortgage payment which has the potential to push you over your housing budget. The more upscale the community and amenities are, the higher your fee is likely to be. Make sure you do your research prior to house hunting so you don’t fall in love with a home that has an HOA you can’t afford. If you fall behind on your fees, you may face foreclosure. An HOA is able to set many restrictions that you wouldn’t find in a regular community. For example, an HOA may dictate what kind of pet you are allowed to own while you live in the neighborhood and how you can decorate during the holidays. If you are buying an HOA property and are planning to rent it out to other people, you may find yourself hurdling roadblocks. For example, maybe only a certain percentage of homes may be used as rental properties or the HOA has to approve all tenats. Ensure that you educate yourself on what the HOA does or does not allow when it comes to renting.